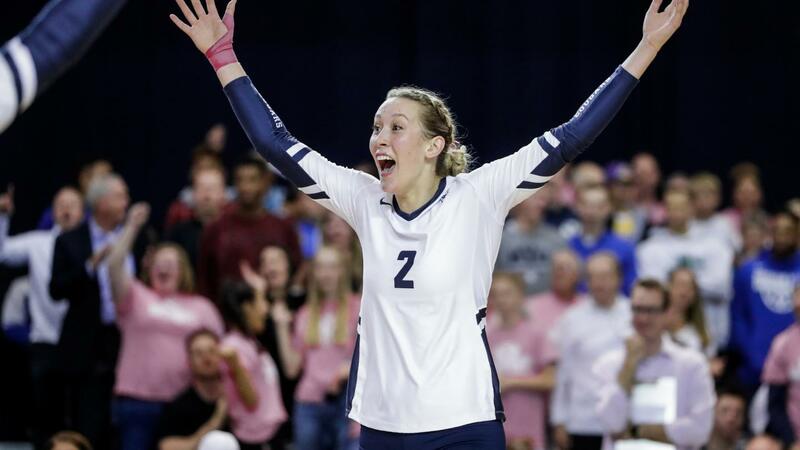 The BYU Cougars, who remain #1 in both the VolleyMob and AVCA Coaches’ polls, continue to slide down the AVCA rankings. The Cougars, now 25-0 on the season, swept the West Coast Conference’s two worst teams, 8-19 San Francisco and 6-22 Santa Clara, last week. They’ve still only lost 2 sets in 15 conference matches so far (both to San Diego), but thanks to losses to #s 179 and 217 in the RPI rankings, the computers punished them for the 2nd-straight week. BYU clinched at least a share of the WCC title (though they will, realistically, win it outright). That was the only real movement in the top 5, as only one team in the RPI top 10, USC, lost last week, though they were only penalized one spot as the computers continue to adore the 19-8 Trojans. The Baylor Bears jumped 4 spots from 19 to 15 after a 3-1 win over Iowa State and a 3-0 sweep of Kansas State last weekend. The wins leave the Bears a half-game ahead of Kansas for 2nd place in the Big 12, with the Bears having a chance at home against Texas on Friday to clinch a seed in the NCAA tournament. Michigan slid 7 spots to #20 after losing 3-0 to Maryland and 3-1 to Nebraska, the latter of which was in front of a sold-out crowd of 1,800 at the Cliff Kean Arena in Ann Arbor. The Wolverines are still safely into the NCAA tournament, but they don’t have many matches left to claw their way back into the seeds – #17 Penn State is pretty much the only opponent left who can appreciably help the Wolverines’ lot. Rice was undefeated in Conference USA play heading into last week, before losing to both FIU and Florida Atlantic. That probably eliminates any chance of the conference getting 2 bids to the NCAA tournament (Conference USA has a tournament to decide its champion) – Rice dropped 6 spots from 31 to 37. While a 37 RPI team has a chance at an at-large invite, if the Owls lose again, they might drop further and out of consideration. Yale jumped 15 spots in the RPI from 61 to 46 after sweeping Columbia on Saturday to clinch the outright Ivy League title. That ensures them of a spot in the NCAA National Championship tournament. UNC Asheville finished their season at 15-11 with wins over USC Upstate and Radford. That moved them up 38 spots in the RPI from 231 to 193 – the biggest jump in the ranking. As compared to the VolleyMob Power Rankings and the AVCA poll, the RPIrankings are calculated mathematically. The intent is to create a more objective ranking to juxtapose the subjectivity of the AVCA poll, though by their nature there is still some subjectivity as to which numbers matter more than others in their calculations.